Inbound & Outbound - monitors and blocks threat traffic in either direction. Full Stealth Mode - makes you invisible to hackers. Kill Controls - instantly disable malicious programs . Passes Independent Leak Tests - to verify complete blocking, see test results. Spy Site Blocking - prevents accidental visits and malicious communication with spyware sites. Kernel-Level Spyware Prevention - protects at the operating system level. Hourly Signature Updates , expanded coverage, and faster detection to find and remove aggressive viruses. Inbound and Outbound MailSafe - quarantines suspicious attachments, stops harmful messages before viruses transmit to your computer. Expanded coverage - catches certain kinds of spyware like adware that others ignore. PC-Based ID Protection - utilizes a combination of anti-spyware and web browser security to block, remove, and disable programs designed to steal your identity. Daily Credit Monitoring - monitors your credit reports daily with email alerts and reports, and notifies you if there have been changes, which is often an indication of identity theft ( US only). Fraud Alerts & Monthly Reports - provided to you. Operating System Firewall - (OSFirewall) constant protection from even the most sophisticated viruses and spyware, rootkits, and kernel-level threats. Program Control - restricts programs from malicious activities, blocking attacks that by-pass other defenses. Early Boot Protection - protects your operating system during start-up. Wireless PC Protection - (automatically detects wireless networks and secures your PC from hackers' threats wherever you're connected - at home or on the road. Privacy Protection - manages and blocks pop-up ads, online profiling, cookies, and cache. SmartDefense Service - provides real-time security updates, quick response to breaking threats, and leverages threat data from the vast community of users to protect your PC from the latest attacks. One-Click Fix It Interface - provides simple overview, 1-button fix if security is off, and easy access to instant upgrades and updates. Millions of Programs Pre-Set - automatically configures security settings for millions of programs. Game Mode - One-click control temporarily suppresses most security alerts and prevents them from interrupting your fun while maintaining protection for your PC. Free Upgrades & Online Customer Support for 12 months from date of installation. 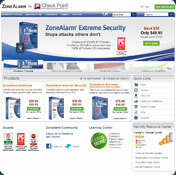 You cannot download any crack or serial number for ZoneAlarm Pro on this page. Every software that you are able to download on our site is legal. There is no crack, serial number, hack or activation key for ZoneAlarm Pro present here. Our collection also doesn't contain any keygens, because keygen programs are being used in illegal ways which we do not support. All software that you can find here is freely downloadable and legal. ZoneAlarm Pro installation package is prepared to be downloaded from our fast download servers. It is checked for possible viruses and is proven to be 100% clean and safe. Various leading antiviruses have been used to test ZoneAlarm Pro, if it contains any viruses. No infections have been found and downloading ZoneAlarm Pro is completelly problem free because of that reason. Our experts on malware detection tested ZoneAlarm Pro with various spyware and malware detection programs, including fyxm.net custom malware and spyware detection, and absolutelly no malware or spyware was found in ZoneAlarm Pro. All software that you can find on our servers, including ZoneAlarm Pro, is either freeware, shareware or open-source, some of the software packages are demo, trial or patch versions and if possible (public domain licence), we also host official full versions of software. Because we want to be one of the fastest download sites on the web, we host all the software including ZoneAlarm Pro on our servers. You cannot find here any torrents or download links that would lead you to dangerous sites. Rate ZoneAlarm Pro 8.0.400.020 Final!